Today we talk to Uneeka Jay, a Speaker, Master Rewrite Strategist and Founding Principal of Rewrite 365, an Experienced Operations Executive, former Senior Vice President of Connect America Medical Alert Company, former Vice President of Customer and Clinical Operations in CadioNet, former Director of Training and Quality of CCS Medical, former Regional Sales Training Manager of Sprint, former Asst. Area Sales Training Manager of Ameritech Cellular, and a former Senior Trainer of Software Engineering, Deluxe Corporation. 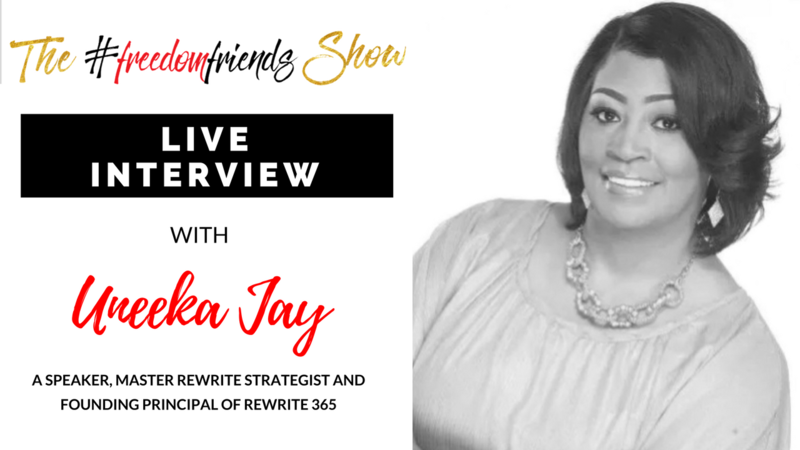 Uneeka and I have an awesome time as she shares on how she practiced her own self-care; how she guides people walk through their way; and her wonderful program, the Rewrite 365 where she helps people identify and solve the gaps. Uneeka Jay is a Founding Principal of Rewrite 365, a program that helps people identify their ideal story and compare it to the current. The program used to close the gap and move from the story that the people are settling for to a story of abundance and fulfillment. Uneeka Jay blends her natural speaking ability, 20 years of training, development, customer service and leadership experience with wisdom obtained from the decade she has spent as a senior executive in corporations with revenues up to half a billion dollars. As a speaker, Uneeka delivers a high energy, direct message to the group emphasizing key messages to move organization or team forward. As a workshop leader, Uneeka works with team to develop a custom solution to meet the needs or utilize one of her many out of the box solutions. The length of the workshop can vary between 2 hours and a full day.